Because a good marinara is the goal with, well, any marinara, start 4 T minced garlic out in 1/3 c olive oil on M heat in a wide pot or deep pan. In one minute, turn the heat to L and walk away. Does the idea of using that much olive oil give you pause? 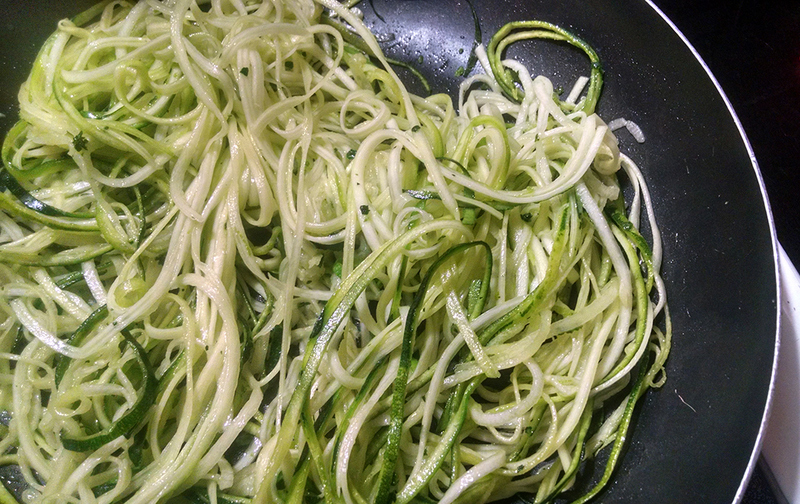 Shush those concerns — olive oil is a good fat, and you’re having no-carb noodles. Mix your second five ingredients and put it in the fridge to ruminate for 10-20m before its transformation into many small balls. Boil water in a large stock pot. Have a big bowl of ice water handy. Once bubbles appear, gently drop in your beautiful, meaty tomatoes. Watch for the skins to split — as soon as a tomato appears to be getting undressed, shut down its party with a full ice bath. Remove the skins and dice the flesh; set aside. 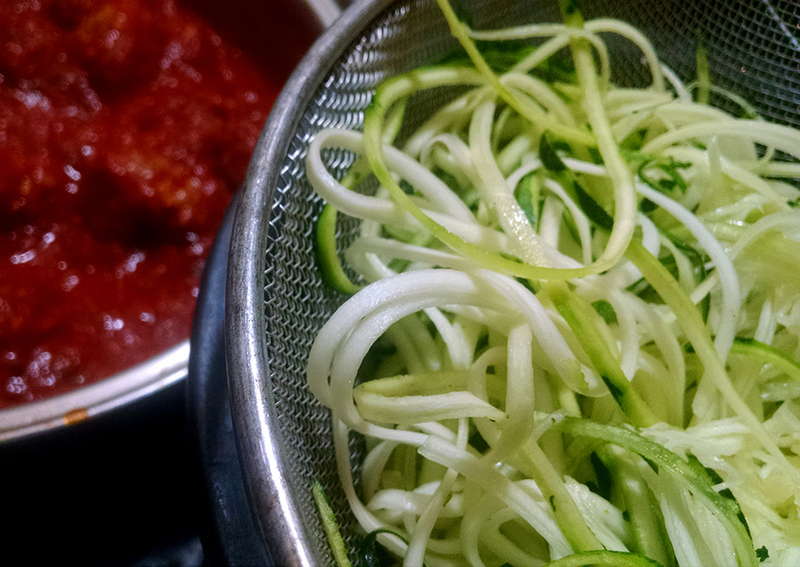 Oh, don’t forget to turn your zucchini into noodles and set in a colander; refrigerate (we’ll get back to those). Ok, now you can regard your garlic. Toss lots of basil into the pan; stir. Turn heat up to M, and before garlic begins to brown, fold in tomatoes. Let them cook over M for a minute or two, then add crushed tomatoes. Stir everything while it returns to a kind boil, then reduce the heat to ML and let it continue to simmer. Preheat the oven to 350° and line a deep pan with foil or parchment paper. 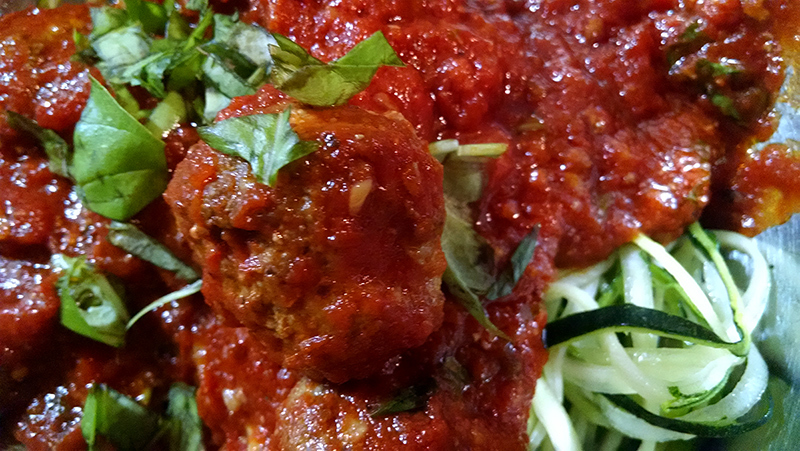 Take your meat out of the fridge and make slightly-smaller-than-golf balls and line them on the pan. Bake for 15m, then remove and transfer into sauce. Stir everything and let the sauce continue to simmer for as long as you can take it (the more patient you are, the better it’ll be). When dinnertime approaches, preheat a large pan over M. When it gets hot, drop in a tsp of olive oil, your noodles, and a dash of salt. Stir-fry until as warm and as cooked as you’d like, then serve slathered in saucy balls. What I did wrong: I did sprinkle a little Parmesan cheese on the final product because I’m nobody’s hero.